“Wormholes” Author is a Liar and Thief. . . But Says It’s O.K. As the author of the new sci-fi adventure novel Wormholes, I’m a liar and a thief. I’ll explain why, and the reasons I think it’s O.K. Some background: The idea for the novel had its beginning years ago in a simple question “What if holes were to suddenly open up into other universes?” As is perhaps the case with most novelists, from that seed of an idea, I began to build a story. And in the process, I invented all kinds of physics. That’s when I became a liar. I was a bald-faced liar because my physics was all scientific poppycock. Then I became a thief. I misappropriated the term wormholes to name these apertures, because it was popular and would attract readers. Again, it was poppycock, because scientifically, my “wormholes” are nothing like the theoretical wormholes of real astrophysics. So, why should I care that I was propagating poppycock? After all, other sci-fi authors devise scientifically ridiculous stuff all the time, from Star Trek to Dr. Who. And sci-fi fans are perfectly willing—like the Queen in Through the Looking Glass—to believe six impossible things before breakfast. However, I felt guilty because in my profession as a science communicator, for decades I tried to write accurately about real astronomy and astrophysics, working at three of the country’s top universities in the field—Caltech, MIT, and Cornell. Was I betraying my own principles, and incurring the scorn of scientists whom I greatly respect? Fortunately, I’ve been able to bury that nagging guilt beneath some pretty substantive—and I think interesting—rationales. For one thing, I wanted to grab readers and lure them into exploring real science, just as I was captivated as a boy by the imaginative writings of legendary science fiction writers Isaac Asimov, Robert Heinlein, Ray Bradbury and Arthur C. Clarke. Their books, which launched flights of fictional fancy from real science, inspired me to want to know more about science, and ultimately to write about it. 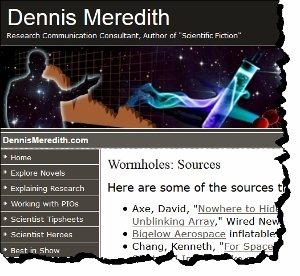 To give readers a path to that science, I even added a this list of sources of real science and engineering that inspired the book to the Wormholes web site. My lying and thievery was also justified because I sought in the novel to reveal some greater truths about science and scientists. For one thing, they’re an incredibly courageous and indefatigable lot. Few lay people realize that the vast majority of scientific experiments are failures. Scientists only advertise their successes, in scientific journal articles and news releases. But despite failure after failure, scientists persist, laboring away until they achieve success. 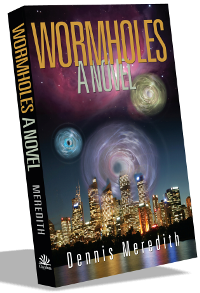 And so, in Wormholes, my characters—including intrepid geologist Dacey Livingstone and iconoclastic physicist Gerald Meier—suffer failures that are sometimes deadly, resolutely learning from each failure and trying again. The novel also portrays another greater truth—that scientists have been censured and censored for their theories, even in the face of good evidence. Among the most notorious modern examples is the censorship of climatologist James Hansen for his assertions that global warming is caused by human activities like burning fossil fuels. I also experienced censorship in my career as a public information officer, which is a particular reason I wanted to portray it in the novel. At Caltech for example, in 1983 the administration killed a news release I’d written about economist Roger Noll. He had analyzed the organizational structure of large government R&D programs, including the then-new Space Shuttle. He declared the Shuttle program a “catastrophe,” because it rushed headlong into a massive construction program without carefully evolving the technology over multiple generations. Roger Noll’s criticisms were borne out by the Shuttle’s massive cost overruns, under-performance, and of course the subsequent, tragic Challenger and Columbia disasters. When my release was killed, I suspected it had to do with Caltech’s ties with NASA, via its Jet Propulsion Laboratory. But I thought maybe the administration knew something I didn’t about Noll or the Shuttle program. Another egregious example: At Caltech, I’d written a news release about a paper by geochemist Clair Patterson on the health hazards of global lead pollution. The head of his Caltech division killed that release, even though Patterson’s evidence was solid and widely accepted. At the time, I believed that the censorship was due to some scientific issue I wasn’t aware of. Today I believe it might well have been fear of offending the powerful oil industry. Patterson’s advocacy ultimately led to a removal of lead from gasoline and other products. So, perhaps I am a liar and a thief. But I can live with it, because not only have I tried to spin an entertaining sci-fi adventure tale. I’ve also tried to inspire readers to explore real science, and given them some real insight into scientists and their quests for discovery.